Here's a quick look at a store that specializes in fresh produce and perishables in Tarrytown, NY. It's affiliated with Krasdale's Market Fresh group. 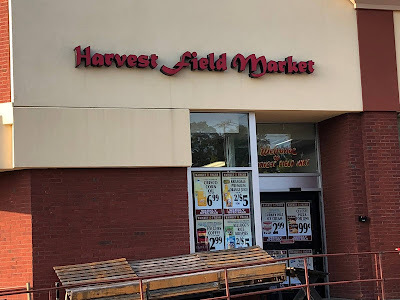 Harvest Field opened their first store at 75 Fleetwood Ave, Mount Vernon, NY in 2010 in half of a former A&P. (The other half, shockingly, became a CVS.) 2016 saw the opening of this location at 350 S Broadway, Tarrytown, which is actually two floors with grocery and deli on the main floor and produce in the basement. This photo, submitted by an anonymous Market Report contributor, was taken in August 2018.